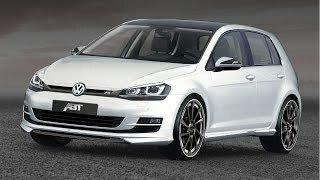 The largest tuner for Volkswagen Cars, ABT Sportsline will be presenting the seventh generation of the Golf, the new ABT Golf VII at the 2013 Geneva Motor Show. 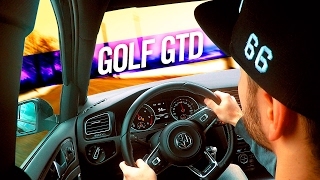 The new ABT Golf VII is a very dynamic car in both its design and technical features. The performance upgrades developed up to now ensure improved acceleration values and far more dynamism, even when the car is fully loaded. The 1.4 TSI has an output increase from 140 HP (103 kW) to 165 HP (121 kW). The 2.0 TDI has an increased output of 180 HP (132 kW) or 210 HP (154 kW). 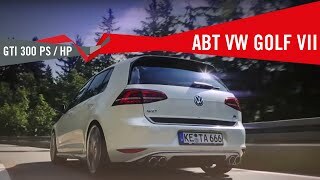 The ABT programme for the Golf VII is rounded off by suspension springs, which lower the car’s centre of gravity, quad exhaust setup, along with a custom sports suspension and several styling changes such as a rear diffuser, side skirts and splitter and a new set of high-speed tyres.